PRO TIP: Are there only some reels you want on multiple CDs, let us know the details here such as their title. Make sure you have identified which ones will be on multiple CDs by labeling their envelop or Ziploc bag accurately! Save your precious deteriorating original reel-to-reel with our audio reel to reel service. The audio signal is digitized using our professional audio cards, then our audio engineers do some light post-processing to remove the inherent tape hiss, trim tracks, amplify and even out the levels. You can have your mp4 audio on a CD to play at home, in the car and on your computer or on a flash drive! Each CD is printed with your personalized title and a personalized jewel case. 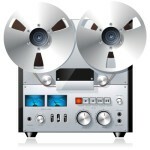 Reel-to-reel tape, also known as open reel tapes came in many shapes and sizes. Most commonly reels are a 1/4 inch in width. Reel sizes ranges from 3″ to 10″ and larger and runtime really depends based on recorded speed and how much tape was used. Depending on how the initial Reel tape was recorded (stereo/mono, single/double sided), the below runtimes may be doubled or quadrupled.